Whether it is a smartphone or tablet, the most widely used feature on any touchscreen device is its keyboard. We use the keyboard for exploring the web through web browsers, taking notes, or typing text messages. Although virtual keyboard apps tend to offer us many benefits, we cannot deny that they often cause problems. Below, we’ve shared some of the major disadvantages of using a keyboard app. Keyboard apps come with smaller key sizes. Accidentally touching nearby keys while trying to type something else. Lack of Physical Sensation: Devices that contain physical keys can give us a sense of what we are typing. Furthermore, the keyboards have large keys. Hence, the chances of typos are very less. When it comes to using a virtual keyboard app, you do not get any natural feeling of pressing a button. Furthermore, shorter space between keys results in typos. Works best on bigger displays: I have tried many small touchscreen smartphones for typing lengthy text messages and e-mails. Although the phones are pocket-friendly and cheap, the typing experience with them is horrible. To get clean touch-type experience, your smartphone should have a big size screen (4.7 to 5 inches). Well, it does not sound a good idea to me to buy an upscale device only for getting one good typing experience. If you are an Android, or iOS user, you can replace your pre-installed keyboard app with third-party one. Just use your device’s “built-in” store app and start browsing for one best keyboard application. Six months later, after making a debut on the iOS, Google finally made the Gboard keyboard app available for Android. 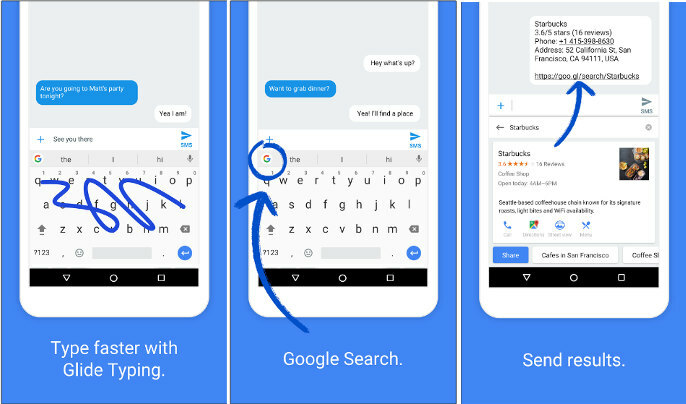 It was worth the wait as the rebranded version of Google Keyboard now comes with some significant improvements and changes that will help improve your writing speed and accuracy. Integrated Google Search: Wouldn’t it be great if users were able to search the web, without having to leave the keyboard? If you too share the same thought, Google has made this possible with Gboard. Google integrated their web search service with Gboard to make it super simple for users to explore and share info on their phone. It enables you to find stock quotes, YouTube videos, weather. You can also get flight details from the app’s interface. To use the search feature of Gboard, tap on the “G” button. The button is located at the top-left corner of the keyboard. When the search box appears on the screen, enter your query in the text field and tap on the find button. Google will instantly load the most relevant result for you. The app allows you to share the search results with just a single tap. Glide Typing: The Glide Typing feature on Gboard allows users to type or enter words in a text field by sliding their finger on the keyboard. To use this feature, tap on the Gboard icon from your device’s home screen or app drawer. Now, you’ll see the Gboard keyboard settings interface. From the menu, select Glide typing. Here you will find four sub-options, but tap on the slider called Enable Glide Typing. Gesture Cursor Control: Moving the cursor on a touchscreen smartphone has never been easier. To solve this annoying problem, Google has come up with a simple, yet a convenient solution. While using Gboard, if you slide your finger across the space bar, it will also move the cursor for you. Themes: We all love to tweak the UI (User Interface) of our device using Android launchers. You’ll love Gboard because it supports customization. The keyboard comes with a fair amount of color themes, which users can change as per their taste or style. Multilingual Typing: In the past, when a user had to type or communicate in multiple languages on a keyboard, they had to switch from one language to another manually. Doing so was quite frustrating sometimes as the user had to leave an ongoing conversation. It shouldn’t be that hard for any multilingual user to type in multiple languages on a keyboard. And with Gboard, it isn’t. Google’s step to add multilingual typing to Gboard has made switching between languages easier than ever. To switch from English to some other language, head over to the app’s settings interface and tap on ‘Languages’ option. Gboard supports over 120 languages. Select your preferred language and start typing. Gboard is powered by machine learning. Hence, it will understand the language in which you’re typing. It will autocorrect your mistakes. Speech-to-text: Like its previous version, Gboard comes with Google’s very own speech-to-text output function. This feature makes it easier for users with certain disabilities to enter text using their voice. Gboard is the best keyboard app for any Android device out there. It is free and offers every single feature you want to use. You can type faster, switch between languages on the fly, change its appearance with themes, use Google Search right from the keyboard and share its results, find GIF images and much more. GBoard learns from your typed data across Google’s apps and services to keep improving suggestions. The Microsoft-owned keyboard app is still one of my absolute favorites when it comes to typing. Gboard might be the best keyboard app, but there are a lot of Android users who still like and prefer to use SwiftKey. SwiftKey has every single feature that makes it one premium keyboard app. You can customize it by switching themes. The keyboard application lets you swipe from letter to letter to enter words, adjust layout/size, type in multiple languages, and much more. But what sets SwiftKey apart is its prediction engine, which is way powerful than any keyboard app on the market. SwiftKey uses the power of neural network technology for learning and understanding languages at a deeper level. When a user is typing using SwiftKey, its prediction engine, instead of looking at the two previous words in the text, starts analyzing the entire sentence to understand the greater context of what you have typed, to offer you the most appropriate next-word predictions. If you are an Android user who is looking for a Gboard alternative, SwiftKey Keyboard is the best option and worth considering. 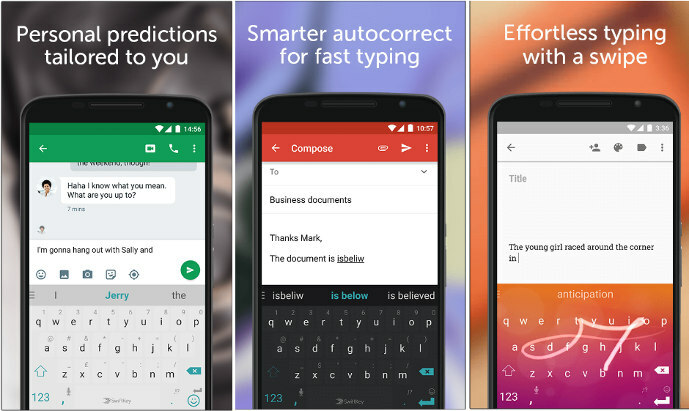 It is one of the best keyboard apps for Android devices. Android Support: SwiftKey Keyboard supports any Android device that runs on 4.0 (Ice Cream Sandwich) and later versions. Fleksy is an innovate keyboard that enables you to find GIFS only through its interface. 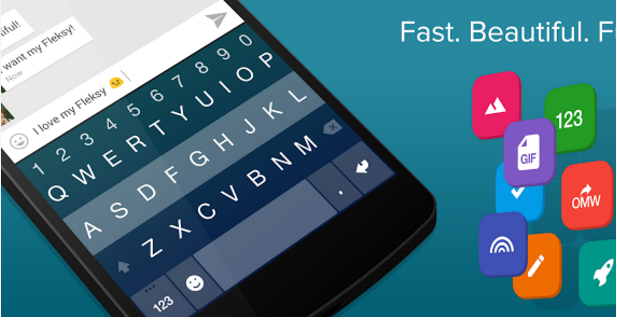 According to its developer, Fleksy is the fastest virtual keyboard in the world. The keyboard for Android offers a powerful autocorrect feature. You can add new features to it by installing Fleksy extensions available on the play store. The app lets users customize the UI. It provides 39+ color themes and gives you access to 750+ emojis. The app lets you define shortcuts to launch your favorite apps. It enables you to switch to 40+ languages. It has a great rating of 4.4 on the Android marketplace. Conclusion: As a keyboard is an app which we use often, you must consider using Android Keyboard applications that provide brilliant experience. The 3 apps we’ve shared above are perfect. They are intelligent and offer support for customization.